Venue: No. 8 Cafe, Westgate Street (no. 6 on the Festival venues map ). Please note : there are 10 steps up to the Festival event area, and there is no wheelchair access. 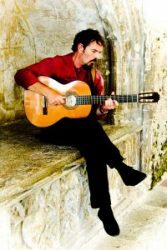 This musical event features the surreal, haunting, exotic poetry of Federico Garcia Lorca, together with a rich and dynamic collection of songs based on poetry by Pablo Neruda, Isabelle Allende and Gabriel Garcia Marquez – all set to Keith’s own music exposing his unique and mature guitar style and his singular passion for transcribing poetry to music. Food will available for purchase at the No. 8 Café from 6.00pm.